Earlier this year, author Donna S. Frelick debuted with her sci-fi romance UNCHAINED MEMORY. 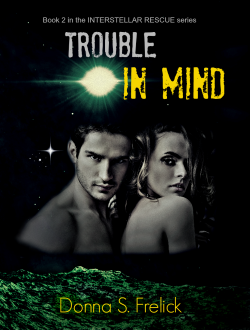 In February 2016, she’ll have a new release called TROUBLE IN MIND (INK’d Press)! Both books are set in her Interstellar Rescue series. Check out her stories if you like contemporary-set sci-fi romance, intrepid heroes and heroines, and alien abduction intrigue. Before I help unveil the cover and blurb, Donna S. Frelick kindly supplied me with a few fun gifs to paint a picture about what you can expect from TROUBLE IN MIND! FBI Special Agent Alana Matheson is good at her job, despite a past that would make even a seasoned agent cringe. She has no time for the outside help the victim’s family has brought in on a kidnapping case, no matter how good looking he is.